Sky+ Android app adds remote control to phones and tablets | What Hi-Fi? Sky has release an update for its Sky+ Android app, bringing remote control functionality to Android tablets and phones. The update brings similar functionality to Android as Apple iPhone and iPad users have had for a few months. The update, which is free, essentially allows you to use your device as a remote. You can pause, rewind and fast forward, change channel and manage your Sky box. The ability to manage your planner and recordings allows you to access and edit your recordings without interfering with the picture on your screen. Find a recording you want to watch and you can simple click, 'watch now' and the picture will appear on your TV. As well as tap controls you can swipe your way around the Sky EPG, ideal if you've got a tablet with a little more screen real estate. The Sky+ app will also make suggest TV programmes, show the most popular programmes and allow you to add reminders. You can also still use the app to set remote recordings on your Sky box when you're not at home. See below. To use this Sky+ remote record app, you'll need a compatible Sky+HD box with the new version of the Sky Guide, which has been rolling out over the last few months. Your Sky+HD box and your Android tablet or smartphone (with the Sky+ app installed) will both need to be connected to the same broadband network. 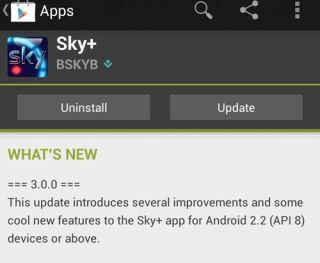 The latest version of the Sky+ app will work on any Android device that has OS 2.2 or later. As well as Sky+ apps for Android and iPhone, Virgin Media last year released a TiVo app for iPhone and iPad offering similar remote control functionality.